Capturing An Excess Return Premium For Illiquidity Is A Privilege Not A Right! Liquidity may be an appealing characteristic for an investment, but a growing base of research is finding that illiquidity may be even more desirable. Because ironically, demand for illiquid investments is so low, that they appear to carry a persistent excess return premium – a view popularized in recent years by those like David Swensen of Yale Endowment, who racked up a whopping 13.9% annual return for the past 20 years in large part by relying heavily on illiquid investments. Of course, the first caveat to investing in illiquid assets is that it is only appropriate for the portion of investments that the investor can afford to segment into illiquid holdings. Yet the more significant (albeit more nuanced) danger of investing in illiquidity is that the return premium is only a benefit for an otherwise sound investment. For a bad investment, owning one that is also illiquid just compounds the problem by locking the investor in! And notably, a bad investment is not just one with poor economic fundamentals, but also one where the interests of the investment manager and the investor themselves are not well aligned – leading to situations where even an appealing investment at first turns out to sour later, as has occurred with illiquid investments from various hedge funds, to certain life insurance and annuity products, and more recently with nontraded REITs. Yet perhaps the greatest misalignment of interests is simply the one that occurs when illiquid investments are sold by salespeople who benefit in the short-term while an investor is locked into the illiquidity for the long run. In other words, illiquid investments may be one situation that is especially appropriate for the involvement of a fiduciary where long-term economic interests are aligned – which goes a long way to explain why illiquidity has served institutional investors like the Yale Endowment so well, even as for the individual investor it so often goes awry! An investment’s liquidity is generally defined as the degree to which it can be quickly bought or sold in the market without affecting its price. For short-term investors, liquidity is crucial to ensure that cash can be generated when needed to satisfy spending goals. For longer-term investors, liquidity is less important from the perspective of converting to cash, but is still important to ensure the easy ability to convert it into another more appealing investment at some point in the future. All else being equal, any rational investor would prefer to hold liquid investments over illiquid ones. However, as it turns out, not all else is equal. A growing base of research suggests that in reality, the prospective returns of highly liquid investments are impaired compared to those that are illiquid. Viewed another way, illiquid investments (and whole illiquid asset classes) have a higher expected return than those which are more liquid. Of course, some return enhancement for illiquid investments would be expected, just to accommodate the implied impact of transaction costs to buy and sell illiquid investments. Yet it appears that investors may actually have such a strong desire for liquidity – even to the extent of being irrational about it – that illiquid investments offer an outsized return premium, over and above just that which would be implied by their transaction costs alone. Investors have such a preference for liquidity that forgoing it can generate a return premium! This phenomenon has increasingly been called the “illiquidity premium”, and the available excess returns appear to be significant and stable enough that a recent Ibbotson paper suggested it should be a factor which itself receives a long-term allocation, similar to having tilts towards size, value, or momentum stocks. In fact, outsized returns previously attributed to the alpha generated by private equity managers are now being attributed to their illiquidity premium instead. The idea of buying illiquidity as a long-term investment has been perhaps most popularized by David Swensen, Chief Investment Officer of the Yale Endowment fund, which has racked up a whopping 13.9% average annual compound growth rate over the past 20 years. 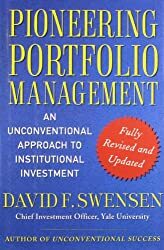 As Swensen explained in his book, “Pioneering Portfolio Management: An Unconventional Approach to Institutional Investment”, these excess returns have been driven heavily by Swensen’s willingness to invest in especially illiquid investments, including asset classes like (direct) real estate, private equity/venture capital, and even timber. In other words, given the strong preference (to the point of irrationality) of most/all other investors to buy highly liquid investments, Swensen’s willingness to allocate dollars into illiquid investments that few others wanted to buy provided an opportunity to capture excess returns through the illiquidity premium. Of course, while investing in illiquid asset classes may have an illiquidity premium offering excess returns, there are also significant downside risks to consider. First and foremost is simply the “danger” that the investor might actually need to sell the illiquid investment at an inopportune time to raise cash for a spending need. After all, by definition, the fact that the investment is illiquid means that it cannot be sold without a significant impairment in value, so getting caught “needing” to sell represents a significant investment risk. For an endowment fund like Yale, which invests with an “indefinite” time horizon and only needs to tap a few percent of its assets every year, putting even a significant portion of assets into illiquid investments isn’t necessarily an issue. For the average investor, however, it can be more problematic, due both to shorter time horizons (i.e., even a long-term retirement time horizon is far shorter than the time horizon for an institutional portfolio), and the potential for an unexpected need for liquidity (from an accumulator being laid off or getting disabled, to a retiree who has a long-term care event). The second caveat of an illiquid investment, though, is that the investor also faces the adverse selling consequences if there’s “merely” the desire to change to another investment. After all, if the investor buys the illiquid investment, and then later the outlook for that investment deteriorates, the investor is faced with a choice of two bad outcomes – hold the bad investment while its value continues to get worse, or sell the investment into an illiquid market that may just cause a significant loss anyway. In other words, an investor who buys an illiquid investment should be prepared to hold it for the long term, which means the investor needs to be confident they will not need the money in the meantime, and that it is an investment that will remain desirable to own and hold over the entire time horizon! Buying an illiquid investment for a long-term time horizon means being confident that the investment will remain appealing over its entire time horizon. This places a significant due diligence burden on the investor up front when evaluating the investment. After all, up until the moment of purchase, the investor can still change his/her mind about the illiquid investment. After the purchase, there’s no exit plan that doesn’t have adverse consequences. In turn, this means that investors should only consider illiquid investments that can be effectively evaluated in the first place. In other words, a “good’ illiquid investment should be highly transparent, at least up front, to ensure the investor can conduct the appropriate evaluation in the first place. This is especially true given that the illiquidity means there is no price discovery mechanism to reveal bad investments – while illiquid investments are often sold on the basis that their prices are “stable”, in reality it simply means that if the investment is performing poorly, the investor can’t tell until it’s too late! Similarly, the lack of regular pricing of illiquidity investments (by definition) also makes it hard to evaluate illiquid investments or asset classes, as there’s little clear track record for results (especially for a new investment) because none of them are traded regularly enough for price changes to reveal the underlying fundamentals! Without transparency, there’s a risk that buying an illiquid investment will simply result in being stuck in an unfavorable one. Only invest in illiquidity if it is transparent enough to properly vet in the first place! Similarly, it is also crucial to recognize that with illiquid investments, alignment of investor/manager interests and the avoidance of conflicts of interest is crucial. After all, the whole point of the illiquid investment is to hold it for the long run. If interests are misaligned, it means that even an investment that looks appealing up front could turn sour later. And again, when the investment is illiquid, there’s no way to resolve the issue that doesn’t have significant adverse consequences. For instance, nontraded REITs have been highly criticized for the fact that the program sponsor raises capital to invest into the real estate property, but also takes a fee for managing the property – which means the program sponsor has little incentive to negotiate aggressively to keep the management fees down. In addition, many nontraded REITs have little or no incentive to seek out good prices for the investment properties or appealing opportunities to liquidate them in the first place (since the bulk of the program sponsor’s return is based on management fees, regardless of whether the property itself appreciates!). In other words, the investor’s interests are not well aligned to the investment manager, as the former only profits if the properties are bought at a favorable price, sold at a better price, and managed for a reasonable cost… while the latter profits the most by charging high management fees and just never liquidating the property at all! Given the dynamics of investing for the illiquidity premium, it is also important to consider the advisor/intermediary that is used to access illiquid investments. After all, the question of whether the advisor recommending the illiquid investment has long-term incentives aligned with the investor is itself crucial to understand the quality of the recommendation. For instance, in the case of investment advisers who serve as fiduciaries, the fiduciary duty places a significant burden on the advisor to conduct appropriate due diligence and ensure the soundness of the investment. As Swensen has shown, for an investment that is otherwise sound, adding illiquidity on top can yield excess returns through earning the illiquidity premium. And, ongoing investment advisers paid for ongoing investment advice have an incentive to earn those illiquidity premiums while also ensuring the long-term growth of the portfolio. The illiquidity premium only applies when stacked on top of an otherwise sound investment. On the other hand, trying to access the illiquidity premium through a salesperson – e.g., investing in (commission-based) non-traded REITs, certain hedge funds, and many forms of life insurance and annuities – is more problematic. The salesperson has a short-term incentive to make a sale, which occurs regardless of the long-term outcome for the investor, and that in turn represents a dangerous misalignment of incentives. Compounding the problem is the fact that the illiquidity of the investment means the salesperson just has to convince the investor once, in a moment of weakness, to invest into an illiquid investment with high costs… and then use those high costs to compensate the salesperson for a commission, while the investor is stuck holding the bag in the long run. In turn, this means investors should be especially wary of salespeople selling illiquid investments that are also not transparent – making it almost impossible to properly vet the investment in the first place, even as there is a high potential that it could be embedded with high costs. Arguably, the misalignment of incentives around illiquid investments – either between the investor and the manager, or the investor and the person recommending the investment – actually accounts for many of the most problematic investments being sold to consumers in today’s marketplace. Similarly, various annuities and permanent life insurance products have long been lambasted for their typically higher embedded costs, which in turn are used to compensate commission-based salespeople to sell those products. The scheme “works” because the investor who succumbs to buying the investment once up front cannot exit the high cost investment later without facing a further impairment of capital. More recent forms of illiquid insurance and annuity products, such as the rise of hybrid long-term care policies, represent an additional investor risk due to the misalignment of long-term incentives between the investor and the insurance company. For instance, the insurance company in a hybrid life/LTC policy is incentivized to under-pay investors on the interest rate of the policy’s cash value, as doing so simply ensures the company will either profit by underpaying low rates of return on deposits, or because the investor walks away and pays both a surrender charge and forgoes previously paid insurance premiums. And variable annuities have a long history of being either high cost, packed full of high-cost proprietary funds (of sometimes dubious investment quality), or being filled with whatever providers will pay for “shelf space” to the annuity provider (again regardless of their actual investment quality). The popular illiquid asset class of recent years, nontraded REITs, has similarly suffered, with a rising volume of regulator scrutiny on improper commission-incentivized sales of high-cost nontraded REITs (in addition to the misaligned investor/manager incentives noted earlier!). In perhaps the worst indictment of the asset class, when regulators recently passed a new rule that would require nontraded REITs to be more transparent about their upfront costs, and potentially subject advisors who sell them to a fiduciary obligation, the leading provider of nontraded REITs announced that it would cease sales altogether in anticipation that the product would no longer be saleable! Consumer-sold illiquid investments often provide inferior returns, not an illiquidity premium! Notably, these woes of illiquid investments sold to consumers represents a significant departure from those purchased by the likes of Swensen and other institutional investors. The difference is that institutional investors have the depth and capabilities to conduct the necessary due diligence, and act as fiduciaries on behalf of their investment fund; they aren’t engaging in illiquid investments to benefit from short-term compensation while the investors bear the long-term consequences. By contrast, illiquid investments for consumers are most often (albeit not exclusively) sold by commission-based salespeople with the associated misalignment of salesperson/investor interests. Does It Make Sense To Invest In Illiquid Investments? Ultimately, as noted earlier, the research suggests that there really is a return premium available for investing in illiquid securities, over and above just the recovery of their implicitly-higher transaction costs. And to the extent that this illiquidity premium is driven by a human behavioral bias in favor of owning more liquid investments, it suggests that the illiquidity premium may sustainably persist in the future. Nonetheless, it is crucial to recognize that since buying into illiquidity means being stuck with it for the long run, in-depth due diligence of the investment is vital. It’s not just a matter of ensuring that the investor won’t need the money during the interim. It is also about ensuring that the investment is sound, the costs are reasonable, and that the incentives of the manager are aligned to the investor so the soundness of the investment doesn’t turn sour later. In addition, when considering a prospective illiquid investment, it is also important to recognize the different dynamics of those who make the recommendation in the first place. Ongoing investment advisers who operate as fiduciaries have a long-term incentive to see the long-term investment work out favorably – and a fiduciary accountability if it does not. Salespeople who are compensated with a commission for selling an illiquid investment have little accountability for selling a high-cost solution, and in fact can be the most profitable from the investments that are the most conflicted for the investor! Illiquid investments should only be purchased through fiduciaries, not salespeople! But most of all, it’s important to understand that the mere fact an investment has greater risk does not automatically entitle the investor to superior returns (just ask any casino or lottery ticket seller!). Similarly, an investment that happens to be illiquid doesn’t automatically entitle the investor to higher returns either. The illiquidity premium only applies when it is stacked on top of an otherwise sound investment. Otherwise, investing into illiquidity simply locks the investor into a potentially high-cost investment from which there is no feasible exit! And the fact that assessing costs and long-term incentives are so crucial also means that having sufficient transparency to evaluate the investment in the first place should also be a requirement for anyone investing into illiquidity. Especially since the illiquidity itself prevents any price discovery mechanism to reveal a problematic investment until it’s too late. The bottom line – if you’re going to invest in something that is illiquid with no good exit plan, be really certain you want to be locked in to it. And, beware buying it from a salesman trying to sell it to you, because the illiquidity may be more in the interests of the salesperson than the investor’s! So what do you think? Do you invest client dollars to capture an illiquidity premium? How concerned should investors be about who is “selling” the illiquidity premium in the first place? How significant should the due diligence be for an illiquid investment? Is The Risk Of LTC Insurance Premium Increases Rising… Or Falling?